Your right to know about food	Your right to know! Time flies and it’s soon Christmas. Toxxscan has some webinars coming up that focus on tips for a tox-free Christmas. Last weekend Toxxscan’s Elina Carblom took part in a training course arranged by the Swedish Society for Nature Conservation´s (SSNC) chemical network, due to the increase in demand of lecturers on chemicals in Sweden. Elina was deeply shocked when one of the speakers, a researcher at the University of Stockholm, spoke about a 1998 survey of 51 Mexican children. The study investigated children from two sections of the same areas. 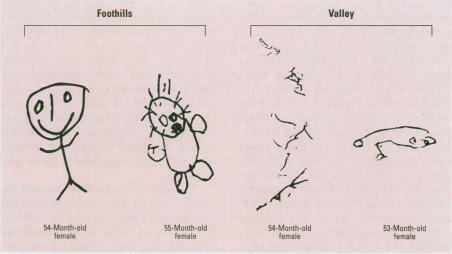 Group one was comprised of farm children (valley) who were highly exposed to pesticides and group two was made up of children (foothills) who had a so called ”normal” pesticide exposure. In one part of the survey the children were asked to draw a man and the difference between the groups was appalling. 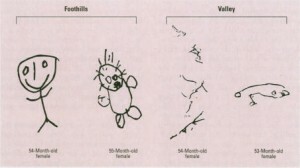 The two images on the left were painted by the children from the foothills group and the two on the right were painted by the children from the valley group who were highly exposed to pesticides.